Why Is Slovakia, a Proud EU and NATO Member, Drifting Toward Russia? Russian President Vladimir Putin and Robert Fico, Slovakia’s prime minister at the time, during a meeting in the Kremlin, Moscow, Russia, Aug. 25, 2016 (AP photo by Alexander Zemlianichenko). BRATISLAVA—Slovakia, a NATO member that has called itself part of the “core of the European Union,” may talk positively about its Western orientation, but its actions recently suggest an increasingly closer alignment to Russia and its interests in Europe. Many observers point to the junior partner in its coalition government, the Slovak National Party, or SNS, as the reason why. 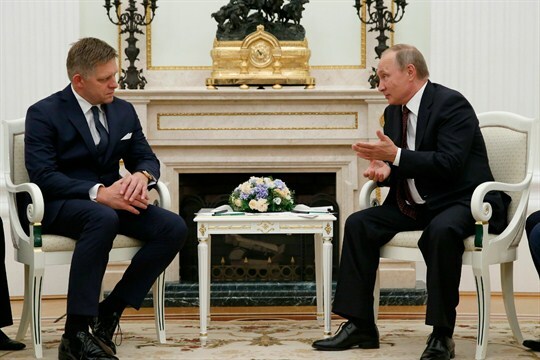 The party’s nationalist, euroskeptic leader, Andrej Danko, the speaker of the Slovak parliament, has visited Moscow twice in the past eight months.